What are you doing this St. Patrick's Day? One of DC’s biggest bashes is set to be atDuffy’s Irish Pub(2106 Vermont Ave. NW). If green isn’t usually your favorite color, it will be this Saturday because they’ll be serving green beer and green Jell-O shots. The regular menu won’t be served, but you will find chicken tenders, fries, tots and corned beef sandwiches. Make sure you bring cash, though, because they won’t be accepting credit cards! Pipers and Irish dancers from the Culkin School are set to perform. Fado Irish Pub and Restaurant(808 7th St. NW) kicks off its annual St. Patrick’s Day Bash starting at 7 a.m. (cover of $10 starts at 8 a.m.). Whether you like sports, dance, music, beer or food (or, let's face it, all of those things), Fado has a place for you! There will be a live streaming of 6 Nations Rugby, a special performance by local Irish dancers, and live music from 40 Thieves and LDE. Sign up for the Paddython 2012 and win a free trip for two to Ireland! Enjoy an authentic pub experience all week long at Ireland’s Four Courts(2501 Wilson Blvd., Arlington). On Monday, March, 12, get your Irish on with an Irish-themed pub quiz starting at 7:30 p.m. Make your Tuesday a little more exciting with the three-course Guinness dinner, featuring executive Chef Todd Davis from Guinness USA. Mentally prepare yourself on Friday for the insanity that awaits you on Saturday by attending Saint ‘Practice’ Day’s Irish Happy Hour from 4 to 8 p.m. All of these events build up to St. Patrick’s Day on Saturday, where guests can enjoy all-day music, food, and festivities. With all the beautiful weather we’ve been having lately, you can enjoy your St. Patrick’s Day at large the outdoor bar at Ireland’s Four Provinces(105 W. Broad St., Falls Church, Va.). Start your day off right with kegs and eggs -- your choice of the 4P’s Irish Fry or the American breakfast with pints, Bloody Marys, Irish coffees, or your drink of choice. The Dirty Pints will be playing live all day long. But you better call and make your reservation soon because the three-course menu of traditional Irish fare is by reservation only. Head to Irish Whiskey Public House(1207 19th St. NW) or The Mighty Pint(1831 M St. NW) for fiddle and bagpipe music... but if you hit up both venues before noon, you'll score a complimentary cup, beads, candy and a T-shirt. Want to be surrounded by staffers and other Washingtonians this St. Patrick’s Day? One of America’s most celebrated Irish pubs,Kelly’s Irish Times(14 F St. NW), is hosting a special event with live entertainment, games, drink specials and some classic American college drinking games. Not only does Kelly’s offer customers a unique experience with the 100+ years of history, but also Irish classics such as liver and onion. Want an authentic St. Patrick’s Day? Well, Logan Tavern(1423 P St. NW) promises a real St. Patrick’s Day party from 11 a.m. to midnight. With all-day menu specials, Irish tunes, games and complimentary “Green Stoly Doly” shots for those wearing green, let the party begin! You don’t have to still be a college student to enjoy Kegs and Eggs -- just go toP.J Clarke’s(1600 K St. NW). 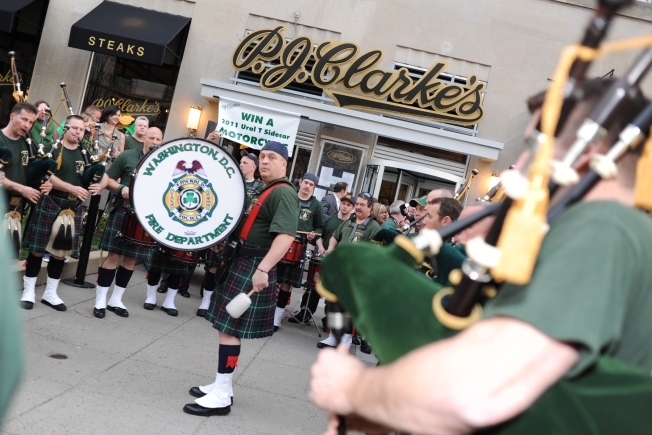 Their legendary (OK, in NYC -- here it's just the second annual) St. Patrick’s Day celebration and start your Saturday with a Jameson and P.J.’s traditional Irish brunch. One lucky guest will be entered to win two Vespa scooters (and we thought socially acceptable daytime drinking was exciting...)! Who said you had to go all the way to Ireland for great beer? Whether you’re running the National Marathon and need to wind down or just wish you were Irish, head on over to The Queen Vic(1206 H St. NE) for $5 Guinness and Irish food specials, starting at starting at 10 a.m. and lasting all day.